PLEASE NOTE: BPW St. Petersburg-Pinellas is a non-partisan organization. The following is a report from one of our members. Any opinions expressed are that of the author and not the organization which does not endorse any political party or candidate. In the early years of our republic, presidential nominees were selected by congressional caucus – a meeting of all party members in Congress who would select their party’s presidential candidate. Later, with the development of mass party organizations, presidential candidates were chosen by national convention. The first political party convention was held by the Anti-Masonic Party in 1831. The Democratic Party copied this idea in 1832 to endorse President Andrew Jackson for a second term. National nominating conventions remained the effective basis for presidential selection until 1968. The process has evolved so that it is no longer in the proverbial smoke-filled backrooms where nominees are selected, but instead delegates are chosen through state caucuses and primaries. Lately, the national nominating conventions have been seen more as coronations of a nominee who was known well before the gavel struck the podium to open the convention. However, conventions still perform important functions – dealing with the party rules that set policy for the next four years and drafting the party’s platform that outlines the party stance on a range of important issues. Conventions are also a great opportunity for the parties to gain prime time media coverage to draw attention to their platform and candidates – and to kick off the general election campaign season. I participated in the Democratic National Committee Conventions in Chicago in 1996, Los Angeles in 2000, Boston in 2004, Denver in 2008, Charlotte in 2012, and Philadelphia in 2016. 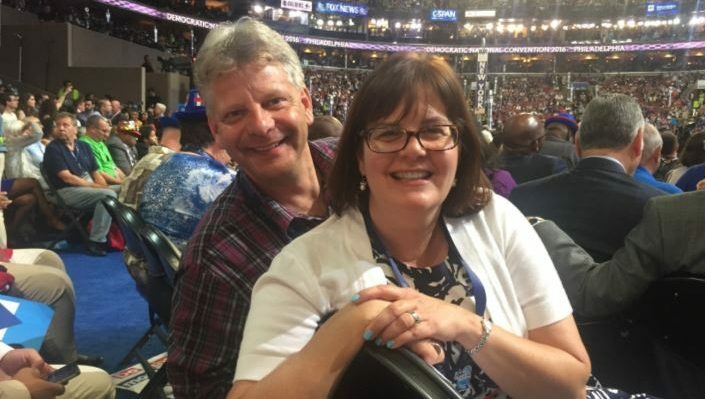 This year I attended the Convention in Philadelphia with my husband, Ramsay, who was a Hillary delegate and one of the whips in the Florida delegation. Days start very early: we needed to be at the Florida Delegation Breakfast by 7:00 am to pick up credentials. And during breakfast we get updates about the day’s events and activities, and we hear from leaders from around the country – many of whom are also speaking on the floor of the convention. Senator Tim Kaine, Governor Howard Dean, Senator Bernie Sanders, Leader Nancy Pelosi, Senator Al Franken, Governor Terry McAuliffe and so many other national and state leaders. It seemed like we had a dozen special guest speakers every morning. Then there are caucus meetings, fundraisers, receptions and other events. For example, we attended a reception with Senator Jeanne Shaheen (both Ramsay and I worked for her at different times) and a reception with President Bill Clinton (with other former staffers). We packed as much in as we could until it was time to head over to the convention hall. We tried to get to the Wells Fargo Center no later than 3:00 pm as the gavel went down around 4:00 pm. There were so many speakers and special guests beginning at 4:00 pm all the way up until the prime time slots. We left the arena around midnight and gradually made it back to the hotel. Of course, there were other events and receptions that went into the wee hours of the morning. We were usually back to our room after 2:00 am, and then we had to be back at the Florida breakfast again by 7:00 am. It certainly takes a lot of stamina to keep pace with the schedule – but one is fueled by the adrenaline and the excitement of participating in such an historic event. And, for Ramsay and me, conventions are like Old Home Week – we see friends and former colleagues from all over the country. I had the privilege of being on the floor with the Florida delegation when the roll call vote was taken on Tuesday night. Vermont went last – so that Bernie Sanders could be the one to make it official that Hillary would be the Democratic nominee – as a sign of unity and solidarity. After the vote, Meryl Streep presented a video montage of women in American political history. And we waved signs that said HISTORY. That night, we made history. For the first time, a woman became the nominee for a major political party for President of the United States of America. With all of the excitement of the convention – Katy Perry’s performance of “Rise” and “Roar” just before Hillary accepted the nomination – and Hillary’s speech — the balloons dropping (and those were some big balloons that night!) – none of that compares to the moment on Tuesday night when history was officially made as the delegates cast their votes.